The Rasta Pasta recipe has garnered a high rating on yelp, zamato, google reviews and more. We pride our selves on creating and serving good quality, savoruing food to give customers a top notch experience they can reccomend to others. We pride ourselves on classic flavors that we offer through innovative fusion dishes. At Rasta Pasta you can order your favorite home cooked Jamaican dishes such as Jerk Chicken with Rice and Peas, Ox Tail, Salt Fish with Ackee and more! Everything served at Rasta Pasta is made 'from scratch'. From our pastas to our jerk marinade, we prepare and cook everything in our kitchen in Kensington Market. As Jamaican and Italian Canadians, the good food is not just what we make but who we are. For example in our world famous dish the Vatican, we combine our beloved Italian paninis with Jamaican chicken that's been marinated for 2 days. Other menu items we're passionate about include the Dreadlock Lasagna, Irie Pizza, Dutch Pot Oxtail and more. Our mission is to serve the best in jamaican and italian cuisine. 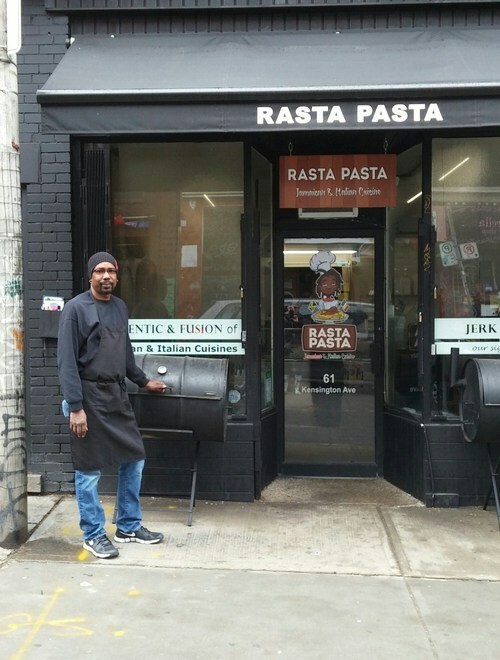 Through the fusion of traditional Jamaican and Italian recipes, Rasta Pasta explores new territory giving customers a savory experience. Some of our best dishes include our grilled jerk chicken panini, Jamaican mi crazy chicken, and our dutch pot oxtail.